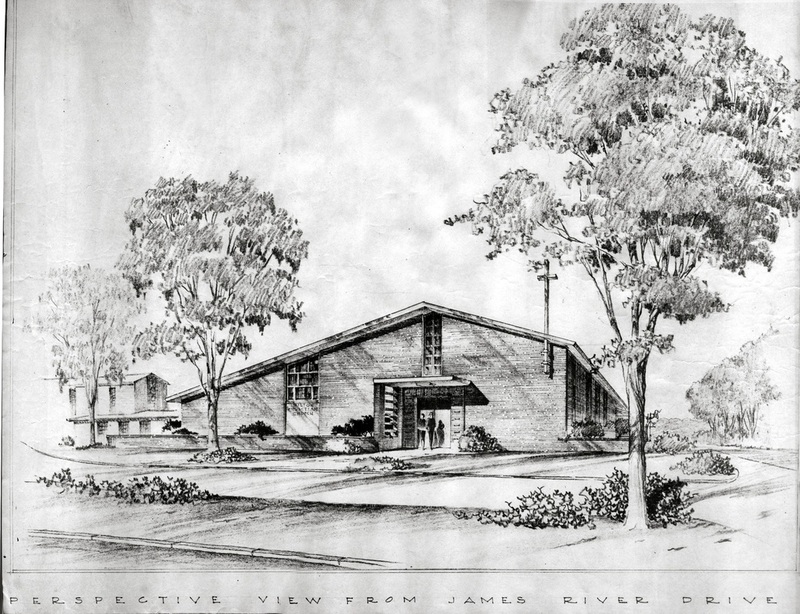 Copy of the original blueprint illustrating the architect's rendering of Hilton Christian Church shortly before the construction began in 1953. 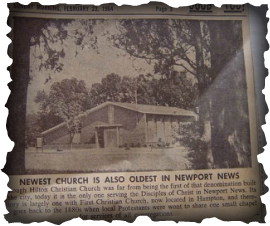 Hilton Christian Church (Disciples of Christ) began in the early 1940’s in the minds of its “mother church” -- First Christian Church (Disciples of Christ) on 30th Street in downtown Newport News. "First Church" was established in 1888. World War II had swelled the population of Newport News and adjoining Warwick County which was becoming a city within itself. In 1945, to satisfy this population expansion and the need for more space, the "mother church" purchased two lots in the historic Hilton Village section of Warwick County. In 1952, it was decided First Christian Church would "gift" these two lots in Hilton Village and also half of its building fund to 78 men, women, and children along with their certificate of transfer. Thus, the beginning of Hilton Christian Church. Ground at 100 James River Drive was broken in December 1952 and members officially received their letters of transfer on Sunday, January 4, 1953. Since the church building was not yet completed, the congregation gathered for approximately 6 months for both Sunday school and worship services at the Woman’s Club of Hilton Village located at 87 Main Street. Dedication of the original church building was June 27, 1953 with 128 chartered members, an increase of 50 over the original 78 who had earlier transferred. Hilton Christian Church (DOC) has had seven "called" ministers, not counting supply or interim ministers, prior to our existing Dr. Williams. Those seven ministers were: Charles W. Miller (1953-1966), Robert G. Parrish III (1967-1975), James Allen Nichols (1976-1982), Edward H. Parrish, Jr. (1982-1988), James O. Hazelrigg (1988 -1994), Richard D. Cline (1995-1999), and Michael Barnes (1999–2004). Current HCC membership is 221 of which 119 are classified as "resident/participating." Average attendance for Sunday morning worship services is approximately 80, peaking over 100 on special occasions. There have been many historical events in the life of the church which have greatly influence ministry, member spirituality/focus, and congregational attitudes in general. HCC’s 50th Anniversary celebration in 2003 in which previous ministers, chartered members, current members, and our many multi-generational family members took the opportunity to worship and renew previous history was a special highlight. However, those events that are most “illuminating” and “stimulating” center on Disciples of Christ, hence DOC, beliefs and HCC’s faith journey to transfer those beliefs into actions. DOC beliefs and ministry focus can best be summarize from the DOC statement of identify --“We are Disciples of Christ, a movement for wholeness in a fragmented world." In 2013, Hilton Christian Church will joyfully celebrate its 60th anniversary. 1973 painting of Hilton Christian Church by the late church member, Bird Soles, hangs near a church entrance for visitors and members to enjoy. Group photo of the church membership taken on Easter Sunday 2005 in the church Fellowship Hall. The "Hanging of the Greens" service is one of the many popular Advent celebrations. In this photo, the church sanctuary is decorated for a recent Christmas season. The first annual "Blessing the Animals" service was offered at Hilton Christian Church in October 2006 by the encouragement of church member, Dorothy Jack. This now popular service is conducted annually in remembrance of St. Francis of Assisi's love for all creatures. Church members, friends and neighbors enjoy bringing their pets to participate in this fun, causal and meaningful service. During the service, candles are tearfully lighted and placed in memory of previous beloved pets. Alexander Campbell preferred "Disciples of Christ" for his followers. Barton W. Stone liked "Christians." Campbell preached at the "Bethany Church of Christ" meeting house in Bethany, Virginia. In 1884, Lucretia Garfield, wife of the 20th United States President, James Garfield, was among the women impatient over the lack of a denominational name. In her region, the ministers decided to use "Disciple Churches." The body if Christians, our "Brotherhood' cousins, who separated from the Disciples in 1906, is called "Church of Christ." In 1955, the other separated cousins formed the fellowship known as "Christian Churches." In 1970, the Chalice with a St. Andrew's Cross became our denomination's official symbol. Charter members gathered in 1953 for a group photo in the newly dedicated sanctuary….now the church's Fellowship Hall. 1953 newspaper clipping announcing the church's first set of deacons and deaconess'. Younger charter members gathered around the church organ to practice a musical presentation for the dedication of the newly-built church in 1953. Annual church bazaar in the Fellowship Hall sponsored by the Disciples Women in the 1970's. A small number of church members gathered for a group photo in 1968. 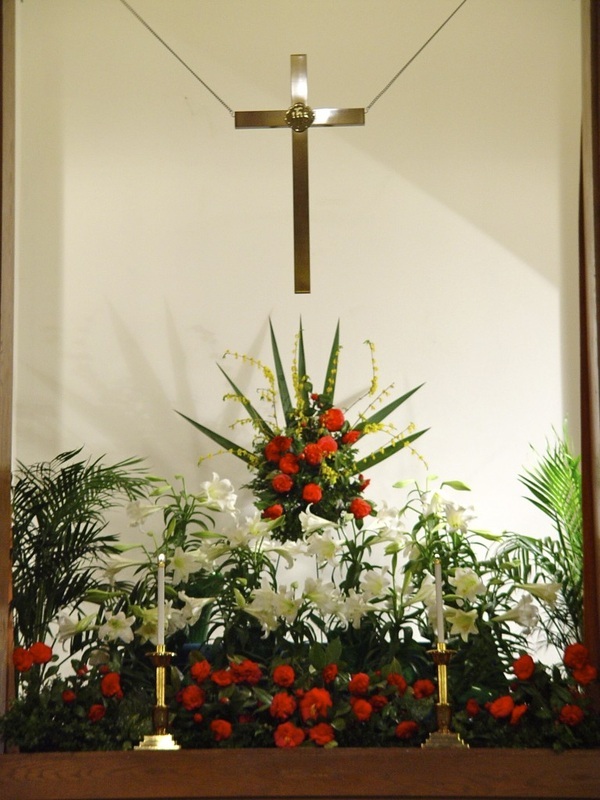 Colorful floral displays in the church sanctuary are the "norm" throughout the year. This Easter display was created by charter member, Helen Abicht. June 1953 newspaper clipping announcing the first Elders selected by Hilton Christian Church. June 1953 newspaper clipping announcing the new minister-The Reverend Charles W. Miller, the first church officers and the dedication of the original church building on June 27, 1953. In 1970, the red Chalice with the Saint Andrew's Cross was adopted as the symbol for the Disciples of Christ denomination. Special bulletin prepared for the January 18 & 19, 1970 dedication services of the new church sanctuary and church expansion. Page from the church directory that highlights the Advent season celebration at Hilton Christian Church. At the April 29, 2008 groundbreaking ceremony for the most recent church expansion were participants (left-to-right): Susie Mowry, board chair; The Reverend Dr. Terrye Williams, and representatives from the construction company, Rancorn Wildman Architects, PLC of Newport News, VA.